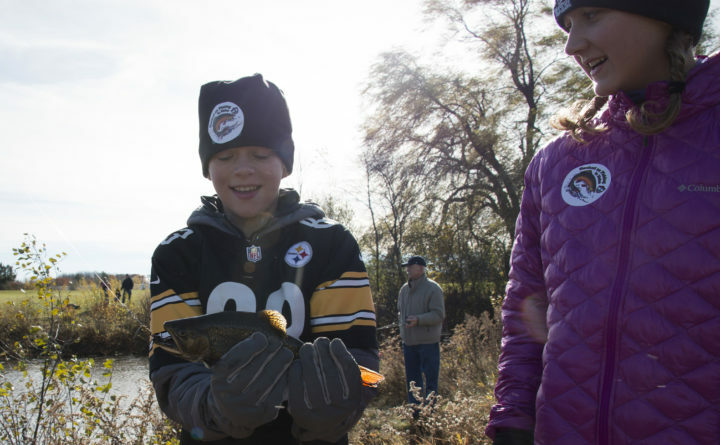 Gavin Monyak, 10, and his sister Ava Monyok, 12, check out a trout that their family caught on Nov. 4, at the fourth annual Bangor Municipal Golf Course Kids Fishing Day in Bangor. The golf course pond had been stocked with 175 brook trout for the event. After days of rain, the sun shined brightly Sunday as dozens of families trekked across the soggy turf of Bangor Municipal Golf Course to try their luck at the fourth annual Kids Fishing Day. Crowding around the edge of a pond near the second hole, they cast their lines in hopes of catching some of the 175 brook trout that swam in the murky water. “I got one!” Jackson Jankowski, 9, of Orrington cried out as he reeled in his third catch of the day. His grandfather helped him unhook the fish, which they then stored in a bag for dinner. Patience was the key to his success, Jackson said. That and the earthworms he’d dug up from his family’s garden for bait. Bracing himself against the cold wind, he cast his line back out, ready to catch another fish. 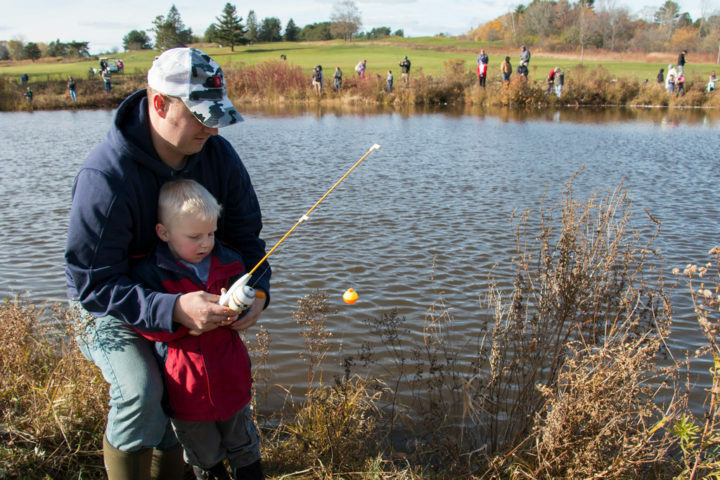 Zachary Szabo, 4, learns to cast a line from his dad, Julian Szabo, on Nov. 4, at the fourth annual Bangor Municipal Golf Course Kids Fishing Day in Bangor. The golf course pond had been stocked with 175 brook trout for the event. “You know, it’s hard for kids to get an experience like this, to catch the fish that they could catch today without driving an hour away and having all kinds of gear and having someone who knows how to take them,” said Rob Jarvis, head pro for Bangor Municipal Golf Course, who created the annual event four years ago with his childhood friend, Wes Ashe. Buddies since grade school, the two grew up in Bangor, and they’ve always fished together. Ashe, now a fisheries biologist for the Maine Department of Inland Fisheries and Wildlife, works with the department to supply the fish for the free event. This year, they stocked the pond with 175 brook trout from the Enfield State Fish Hatchery. 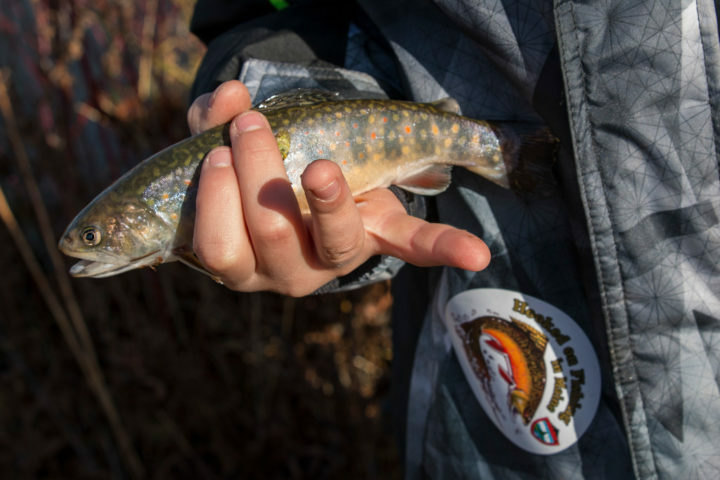 Jackson Jankowski, 9, of Orrington, holds a small trout he caught on Nov. 4, at the fourth annual Bangor Municipal Golf Course Kids Fishing Day in Bangor. The fish was his third of the day. 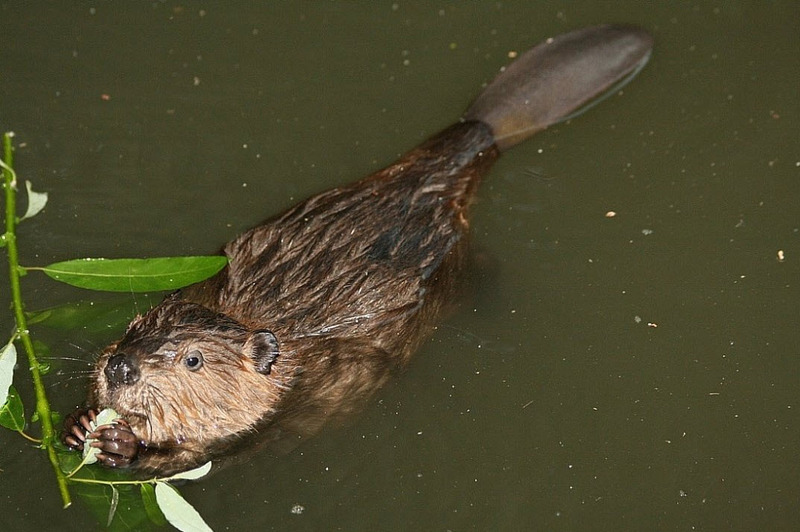 “He has the fish, I have the pond,” Jarvis said with a laugh. For many of the children at the pond that day, it was their first time fishing. The participants varied in age from infants in baby carriers to teenagers, and every child was accompanied by an adult. Because of the heavy rainfall in the days leading up to the event, the pond was murky, which may have explained why children were catching fewer fish than in past years. Nevertheless, they were having plenty of fun. “Quack, quack, quackity, quack!” Nora Foley, 3, of Bangor cried as she watched four mallard ducks swim slowly across the pond. Forgetting her rod, she let it drop in the underbrush at the pond’s edge and jumped up and down on the balls of her feet. Across the pond, another child joined the chorus. 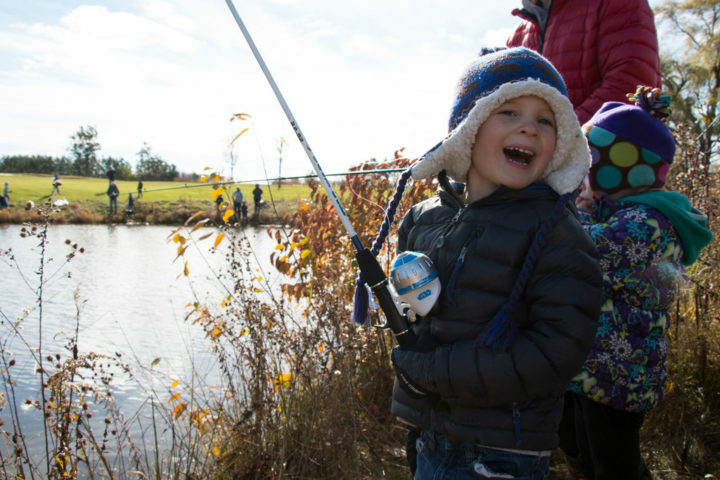 Alderic Martin, 4, of Bangor flashes the camera a smile while fishing on Nov. 4, at the fourth annual Bangor Municipal Golf Course Kids Fishing Day in Bangor. The golf course pond had been stocked with 175 brook trout for the event. After a laugh, Nora’s father, Steve Foley, quieted her down and handed her back her fishing rod. Meanwhile, her 5-year-old brother, Henry, watched his bobber, waiting for it to dip beneath the surface. And beside him, his friend, Alderic Martin, 4, fished with his father, Keith Martin. “I’ve caught 100,” Alderic said, speaking of his past fishing experience at his family’s camp. “I want a trout for dinner,” Henry chimed in. Let’s hope his wish came true.